Tea: A Mirror of Soul by Tan Dun, presented at the Santa Fe Opera, is rather like Tristan seen in flashback. In this opera it is the man who survives. In the prologue the hero sits and drinks from an empty bowl, and when he is asked why he does this, he recalls that once he was a prince. The musical elements tell the three great acts whose texts come from the Book of Tea. In the act of water and fire Prince Seikyo travels into a new land and meets Princess Lan, her brother and her father, the Emperor. He pays suit by extemporizing poetry and is found to be worthy to marry Lan. The source of conflict comes from the brother who claims to have The Book of Tea in his pocket. Seikyo claims it is fake, that the true Book of Tea is owned by Lu Yu who lives in a land far away. Fire is carried in lights. The opera begins with wands of light, symbolizing carried fire, which seem to be bowed. How does one make music from water? Three players splash in three bowls of water at the sides of the stage. The water trickles, splashes or flows through sieves. These are not sounds we associate with music. The act of paper is a giant love duet, just as it is in Tristan. Lan and Seikyo are traveling to see Lu Yu to find The Book of Tea. They continue their courtship and consummate their relationship under a blanket in the middle of the stage. The sound of paper is sometimes the sound you could make by blowing against the edge of a sheet of paper. Or it is the sound of paper crumpling. Or it is the sound of scrolls rattling. The act of ceramic and stone comes at the arrival to visit Lu Yu who has recently died. It is known that Siekyo and Lan are coming. They find the true Book of Tea, but the brother arrives and insists on fighting the prince. Lan works very hard to intervene to save the two people she loves most from killing each other and is killed in the process by her brother. Two sets of tuned ceramic pots were created for this scene and placed on each side of the stage. They are played like percussion and produce a rich, evocative sound. When the scene turns to violence, stones are clashed together by players who surround the action. Tan Dun's vocal writing is closest to Berg, with lots of leaps and jerks and extremely high notes. The brother part, ably sung by Roger Honeywell, is full of very high notes. The biggest problem with Tan Dun's musical style is this disconnect between the pointillistic expressionist style in the vocal parts and his very original, very sparse, very liquid orchestral style. I liked very much how it was sung here. The singers did a much better job of completely embracing and phrasing the music than their more famous counterparts in The First Emperor. It was excellent. Haijing Fu as Seikyo and Kelly Kaduce as Lan were especially fine. This very original musical conception was given a fairly standard operatic mounting. See pictures here. The Santa Fe Opera house is itself spectacularly original, with gorgeous views of the surrounding countryside which integrate into the production. At the end of the opera the back of the stage opens up to show the lights of Santa Fe. 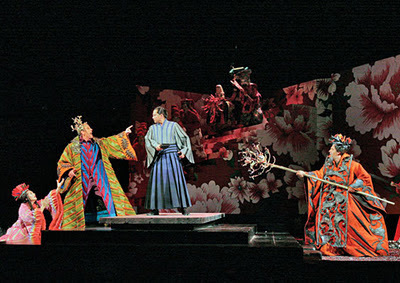 The setting is complex, especially because the fire, water, paper, ceramic and stone players occupy the stage with the actors. The costumes are traditional oriental, and the sets are evocative of oriental decoration. The visual elements helped to clarify the action, always a big item for me. Lan and Seikyo and the brother are all easily distinguished from the other people occupying the sometimes very crowded, shall we say occasionally too crowded, stage. In all I thought it was very successful, as an opera, as a production and as a performance. Tan Dun's style seemed purer here than in The Last Emperor, and I liked it better. I liked the additional layer of abstraction in the element of tea.